N.p. : N.p., n.y.. Paperback. Folio. Stiff glossyt decorative wrappers. (80pp). Extensive illustrations. Very good. Mild wear to outer wrappers (only). A tight, nice copy of this collection of noteworthy front pages ranging chronologically from 21 August 1849 to 3 November 1976 ("Carter Wns Cliffhanger") and covering all the expected major events, Bibliographically cryptic, but no doubt published in Des Moines by the "Des Moines Register," probably in 1976 -- and apparently updated at least once, for a 1973 edition runs up through newspapers of that year. Boston: J.B. Yerrington & Son, 1858. Paperback. Folio (25" X 18"). Self-cover. 4pp, numbered 13-16. Very good. Mild age toning, faint edgewear and usual folds, but overall clean, nice and quite handlable. A superb full issue of the most famous abolitionist newspaper of them all, beginning in 1831 and running weekly until 1865. Large provocative masthead, subtitled ""Thou Shalt Love Thy Neighbor," depicts Jesus at center with the wraparound caption "I Come to Break the Bonds of the Oppressor," while a slave auction takes place to the left of this and a plantation slave family celebrates emancipation to the right of this. 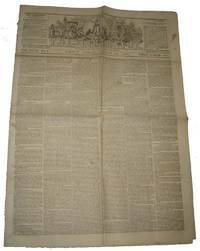 Six columns of this large paper report slavery and abolitionist events from around the country. Front page headlines include: "Refuge of Oppression: What the Slave-Driving South Demands of Massachusetts," "Increase and Horrors of the Slave Trade," "Southern Supremacy on Congress," "Thrilling Congressional Reminiscence," etc. A wonderful example in far better than average condition. London: The Daily Mirror, 1935. Folio (12" X 15"). 32pp. Illustrations. Good plus. Mild even age toning throughout. Attractive full issue of this popular daily tabloid newspaper, founded in 1903. Headline reads, "THE KING GIVES THANKS," subtitled "In Unity with All His People," the bulk of the front page consisting of a photograph of the king and queen kneeling on on benches in front of their thrones at their silver jubilee thanksgiving service. The following year, King George V died. A sharp example. [New York: Harper & Brothers], 9 July 1864. Folio (11" X 15½", opens to 22" X 15½"). Large steel engraving surrounded by twelve small steel-engraved vignettes. Very good. Faint original vertical fold; single small (¼" X ½") paper loss near top of this fold, not affecting image (but touching upon the "Harper's Weekly" running head). Overall clean, attractive -- quite fetching. Centerfold two-page spread (pp. 441-442) of this famed weekly. Large center steel engraving (14 3/4" X 9") titled within the plate "A Council of War / at Massaponax Church" is based on the famed Alexander Gardner photograph showing Grant and Meade's staffs seated in a group of scattered church pews, Grant examining a map. Twelve small military vignettes surround this, titled (clockwise from top) "Constructing a Military Road," "Burying the Dead," "Jericho's Mill and Pontoon Bridge N. Anna R.," "Braddock's Coach, Guinness Station, VA.," "Dead Rebel Soldier, Pine Forrest 19. May," "Bethel Church," "One of Ewell's Soldiers," "Beverly House," "Confederate Soldiers Laid Out for Burial," "Soldiers in Rifle Pits Near Chesterfield Bridge N.A. Rives," "Quarles Mill, N. Anna R." and "Rebel Redoubt on the North Anna." A striking rendition of this famed war image. Lawrence, KS: G.W. Brown & Co., 20 December 1856 (Vol. 2, No. 22). Large folio (19" X 25"). Self-cover. Good plus. Mild sporadic age toning and occasional inoffensive foxing, with minor edgewear and slight soiling. Overall an attractive example of one of Kansas' first free-state newspapers, founded by the noted abolitionist GEORGE W. BROWN (1820-1915) in January 1855. He was associated with the New England Emigrant Aid Society, which is considered the town's founder. Brown was arrested by an irate pro-slavery mob led by the infamous sheriff, Samuel J. Jones, on May 21, 1856 and his offices trashed and burned. He spent four months in jail on high treason charges, later dismissed, and continued publishing his newspaper until December 17, 1859. This interesting issue is filled with countless newsworthy tidbits concerning the free-state versus slave-state issue and other anti-slavery matters. The leftmost column of the first page makes reference to the May 21, 1856 destruction of the "Herald of Freedom" offices, too: "We are pleased to observe that our friend, Henry M. Kimball, who was engaged in the Herald of Freedom office, at the time of its destruction, in May last, has become associated... in the publication of the Carlinsville, Ill., Free Democrat...." And best of all, a classified ad on the fourth page, under the headline "Still Alive! ", comes from Lawrence pioneer CHARLES STEARNS, a William Lloyd Garrison supporter from Massachusetts and former Underground Railroad conductor who arrived in what was to become Lawrence on May 26, 1854, and built that city's first structure, a crude log cabin. It reads: "The old mud shantee came very near being destroyed on the memorable 21st of May, but it wasn't. I am still alive, and have a few goods, and a very little money left. Should be happy to see all my old, and a few new friends at the old shantee, next to where the 'Fort' was, but alas! is not. In a few weeks I expect to move into a comfortable Stone Store, that is, if I am not arrested for 'horse stealing' before. When I get there, shall be very happy to see all Lawrence, and the surrounding country. -- Shant have much to sell, but shall be glad to see all, gentlemen and ladies, and talk politics, religion, & c....." The notorious "sack of Lawrence" on May 21 destroyed a hotel (the "Fort" referred to) and several other businesses along with the "Herald of Freedom," and Stearns' shop was no doubt one of them. (Whether the "mud shantee" is this first building at 620 Massachusetts Avenue remains to be determined -- or perhaps Stearns had a separate building for his store.) A superb issue of this scarce newspaper, with excellent references to the attempt to destroy it. Madison: Wisconsin State Journal, 1868 September 24 (Volume XVI, Number 9). Folio. 4pp. Very good. Slight binding traces along fold, else white and clean and strong. Handsome, bright issue of Wisconsin's official state paper, with one of the front page columns devoted to "A Visit to Galena -- Gen. Grant at His Home." Grant was clearly full steam into his first presidential bid: the second page featuring a list of "Republican Nominations," headed in large type "For President -- Gen. U.S. GRANT." Other political tidbits include the formation of "Grant Clubs" at various locales, "Mrs. Lincoln and her son Tad passed through Pittsburgh, on Monday, for Ohio," etc. Interesting atmosphere content and the expected boilerplate advertisements for patent medicines. Paperback. Washington, DC: Gales & Seaton, 3 February 1816 (Vol. XVII, No. 2397). Folio (12½" X 19¼"). Self-cover. 4pp. Good plus. Quite legible and handleable, though printed on a tannish-greyish stock; occasional irregular age toning, especially heavy on the final (4th) page. Good topical political content from the influential tri-weekly, founded in 1800 by Samuel H. Smith (and running until 1866). Second and much of third page occupied by "Debate on the Treaty," namely speechifying by Messrs. Randolph and Pickering. Signed at upper left corner of front page in blue fountain pen by a noted Illinois Civil War collector: "Owner / W.K. Bracken / Bloomington, / Ill."
New York: New-York Daily Tribune, 21 April 1865 (Vol. XXV, No. 7501). Folio. 8pp. Very good. Quite mild age toning and bit of wear and light soiling along original folds; minor edge curling and very small edge tears. Black mourning borders. Lincoln assassination coverage dominates the front page news of this daily, with the leftmost of the six columns featuring a bold (for that day) headline: "OUR LOSS. / A Day of Fasting and Prayer. / The president's Assassin. / Further Rewards Offered," and so on. Despite mild wear, quite attractive and displayable. Springfield: Baker & Phillips, April 25, 1865 (Vol. XVII, No. 268). Large folio. (4pp). Black mourning borders. Very good. Minor soiling and minor wear along some original folds, but no binding traces and remarkably few edge tears. Lincoln's body had just left Philadelphia en route to Springfield via a special funeral train when this issue appeared. Some other headlines: "Mosby Surrenders Conditionally on Johnston's Terms," "Lee's Paroled Soldiers Tearing up the Railroads," "Fall of Montgomery Confirmed," "Condition of Secretary Seward and Son." An attractive copy. Chicago: Young Men's Christian Association, 1 December 1885. Folio. ii, pp. 264-276, ii. Very good. Light even age toning, with very few of the edge tears that plague these publications. Tight, clean and attractive issue of this semi-monthly, featuring contributions from Dwight L. Moody and other popular clerics of the day and numerous brief religious and inspirational news items. Interestingly, this copy retains the usually-absent OUTER wrapper (preceding the regular masthead page), which consists almost entirely of small advertisements. Uncommon to find in such nice, handleable condition. Moody served as president of the Chicago branch of the YMCA from 1865 to 1868 and remained closely involved with the organization thereafter; the year after this issue he assisted the national YMCA in creating the Student Volunteer movement, an important development for American Protestant missionaries. Chicago: Press & Tribune, July 16, 1860 (Volume XIV, Number 12). Folio. 4pp. Good plus. Minor age toning, bit of dampstaining, but overall clean and attractive; 9½" X 2½" paper loss from lower edge of last leaf, affecting only boilerplate ads. Lengthy political coverage, text of Charles Sumner speech on Republicanism, etc. Good atmosphere content, numerous boilerplate advertisements, etc. Cleveland: The Temperance Artisan, 1847 February 26 (Vol. I, No. 11). Folio (23" X 16"). (4pp). Good plus. Bit of mild soiling to front wrapper and several small edge tears, but overall quite handleable and fairly attractive. Nice copy from the first year of this uncommon short-lived weekly which according to its elaborate masthead was "Devoted to Temperance, Mechanics, Science, Literature, Agriculture, and the News of the Day." Yorkville, IL: April 20, 1865 (Volume I, No. 50). Large folio. (4pp). Very good. Minor age toning and spot of foxing; a bit delicate, but not separated, along original folds; some jagged edges; original recipient's name inked along top edge of front page. Overall a clean and attractive of this uncommon weekly. Black mourning borders (first three pages). Extensive assassination coverage. Springfield: Baker & Phillips, April 26, 1865 (Vol. XVII, No. 269). Large folio. (4pp). Black mourning borders. Very good. Minor soiling and minor wear along some original folds, but no binding traces and remarkably few edge tears. Further news on the route of Lincoln's body en route to Springfield via a special funeral train, plus more surrender details, etc. An attractive copy. New York: Weekly Guardian Associates, 1962 November 29 (Vol. 15, No. 8). Folio (11½" X 15"). 12pp. Very good. Mild normal age toning, with faint wear along single horizontal fold (as issued). Nice typical example of this radical leftist weekly, founded in 1948 by Aronson and continuing until 1992. This particular copy came from the library of famed protest poet and fine press printer JOHN BEECHER (1904-80), who pencils "(Ad: RTTS & OP) MR" and pens "Marked Copy -- See Pg. 8" in red large and bold near the top edge of the front wrapper. On this page appears a box ad for Beecher's latest poetry collection (and probably his best known), "Report to the Stockholders and Other Poems," which he brackets in red ink. Paperback. N.p. : Wisconsin State Prison, September 1938 (Vol. 4, No. 9). Small 4to. Stiff tan wrappers. 36pp. Very good. Unusual jailhouse publication, filled with prison-related stories, poetry and regular columns such as "Prose for Cons." Very interesting. Richmond: Daily Dispatch, 1865. Paperback. Folio. 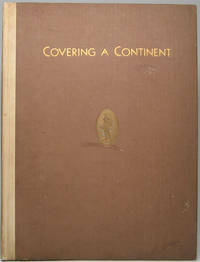 Self-cover. 4pp. Good only. Age toned and somewhat soiled, with a couple of centerfold edge tears. Overall quite respectable looking, though, with no edge chips. Decent full issue of this Confederate newspaper from the capital, dated several months prior to the Confederate government's evacuation in early April and the subsequent burning and occupation by Union troops. Typical late war news. Some wear issues, but easily legible and quite "handleable" -- very uncommon in any condition. Southern newspapers were generally printed on inferior quality paper, hence usually exhibit more age toning than their Northern counterparts. Chicago: Chicago Tribune, November 11, 1865 (Vol. XIX, No. 163). Large folio. (4pp). Near fine. Clean and handsome, free of foxing and edge tears -- altogether superb. Civil War wrap-up news: Execution of Andersonville commander Henry Wirz, etc. Washington, DC: Labor Newspaper, 1971. 73 miscellaneous issues, divided as follows: 1971 = 14, 1972 = 24, 1973 = 13, 1974 = 6, 1975 = 10, 1976 = 6. Folio. Each issue 8pp. Illustrations. Most good to very good. Usual minor age toning expected from newsprint; each folded in half, as issued. Interesting gathering of this union newspaper, "the national paper of 14 unions representing raillroad, airline and other workers in the U.S.," housed in a faux wood finish cardboard clamshell box.